the only thing that could be wrong is the system panel header? would that stop it from posting ? is this where they are supposed to go? Last edited by manny365; 04-08-2011 at 07:07 PM. i just got a new build and i got the same problem it powers on all fans spin,gpu fan spins,coller spins, drives open/close hdd powers on makes noises. 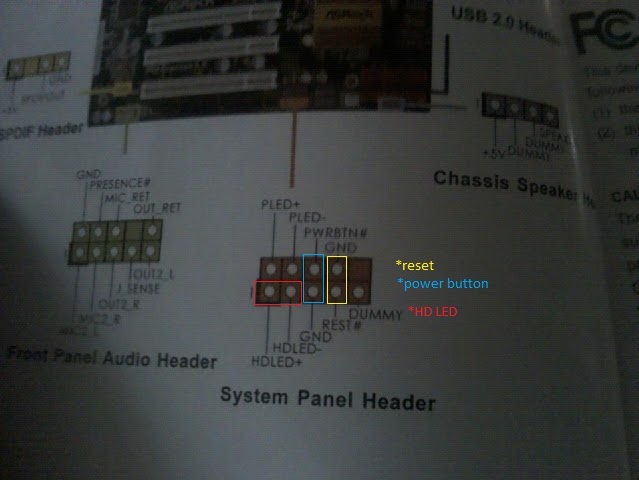 but mobo a770de dosent make a sound no beep nothing,dosent boot at all no video when i connected to my monitor or tv. anyone says dead mobo or do i need to change some jumpers or something??? plz HELP!!!!! i got 30 days return policy! The 2 connectors (yellow & blue in the pic) in the vertical position actually go horizontal. Last edited by rscott521; 04-24-2011 at 10:53 AM.